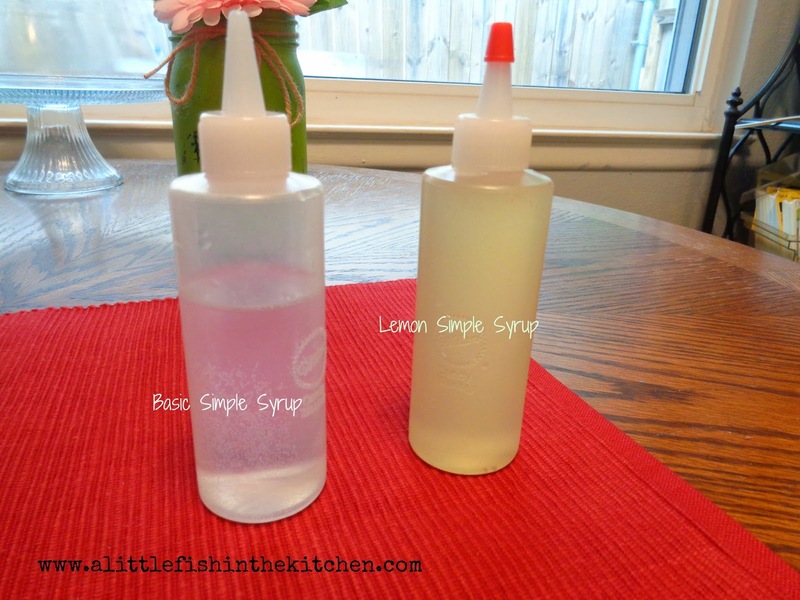 Simple syrup is a good and easy recipe to have in your repertoire. It sounds fancy, but it's ridiculously easy to prepare and it makes certain tasks in the kitchen, especially when it comes to drink mixing, so much easier! In restaurants, bars and bakeries it's something that gets used every day in several ways. Restaurants use simple syrup to candy fruit rinds, or to poach fruit for dessert dishes. Bartenders in upscale bars make many specialty-flavored simple syrups every day to add to your favorite cocktails. A little known fact is that bakers use simple syrup to "fix" dry cakes or they may use syrup on each and every cake to add extra moisture and a hint of flavor. In my bakery business, I use simple syrup to help my white and yellow cakes stay moist. As long as you get the basic water to sugar proportion right, the sky is the limit when it comes to adding a hint of flavor to your syrup. You can use fruit juice, extracts, spices, liquor or liqueur, or flavored sugars, such as maple sugar to add a little flavor pop to it. Some people prefer to infuse their syrups with whole fruit or spices and then strain the syrup when it's ready to use. Even if you don't work in the food industry, there are still some everyday uses for simple syrup at home. You can use it to sweeten those powdered drink mixes that little kids love or a pitcher of iced tea. If you're like me, you've had to hover over a pitcher of blue Kool-aid and stir for what seems likes an eternity to get granulated sugar to dissolve! If you replace that course, granulated sugar with syrup, you can just give it a quick stir and go on with your day! The base recipe for simple syrup is 1:1 sugar to water. Just remember to keep the proportions of sugar to liquid equal, and you can manipulate this however you like to add flavorings. Once your syrup is made, store it in the refrigerator where it will be fine for a long, long time! Yes, seriously, at least six months or more. Sugar, in large quantities, is one of the best natural preservatives! To store my syrup, I use candy melts squeeze bottles which are available in the cake decorating aisles at Walmart and craft stores. 1. Pour sugar and water in a small sauce pan and heat to a boil. Once the mixture boils, reduce it to a simmer just long enough for the sugar to completely dissolve and and the liquid becomes clear. This should take roughly one minute! 2. Move off of the heat and allow to cool completely. 1/2 cup fruit juice of your choice: lemon, lime, orange, cranberry, apple, pear, grapefruit etc. 1. *repeat step one for basic simple syrup. 2. Move off of the heat and stir in the juice. Mix well and allow to cool completely. 2. Move off of the heat and stir in spirit. Mix well and allow to cool completely. 1. Make basic simple syrup. 2. Flavor with one teaspoon of any extract once the pan is off of the heat. Maybe two teaspoons after you taste it. Extracts are so concentrated, just a little goes a long way. Let me know how you use simple syrup in your kitchen!